"Thank you so much for the support and seminar strategies! I closed two deals for $20,000/month contract for 36 months! And I still have more leads to follow up with!" "We had 81 people register for the seminar, with over half of them being new prospects. From that, we had 19 companies sign up for the threat assessment (all 50-100 seat companies) and five companies sign up IMMEDIATELY for our Managed Cyber Security Defense Package that we were selling. On top of that, we didn't have to pay a dime since we had six sponsors who foot the entire bill for the seminar. I'm counting it as a huge success!" "I had 58 people register and 55 attend our recent cyber security seminar Robin showed me how to do. 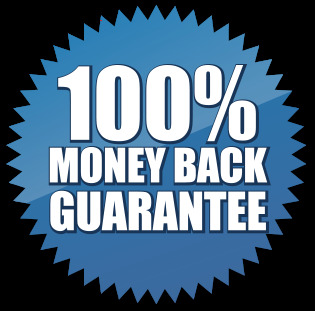 From that seminar alone, I sold three Security Audits at $3,500 each AND got a new managed services client for a $10,000 project with monthly reoccurring revenue of $19,800 over 36 months!" "Thank you for your advice, Robin! I had 40 people register for the event and have already closed a $10,000 managed services contract from the seminar and have an appointment with another lead tomorrow! Again, just want to let you know that your formula works! (But then you already knew this!)" Yes! 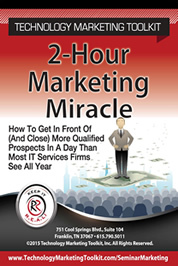 Please give me INSTANT ACCESS to the "2-Hour Marketing Miracle" along with the Cyber Security Seminar In A Box. Review the program for one full year (365 days). If you don't feel it was worth FAR MORE than what you paid, simply return the product to our office and we'll issue you a full and complete refund. "On just my first seminar following Robin's method, I had 22 of 24 registered people show up, got one appointment booked that turned into a $7,000 monthly deal, AND got three additional opportunities to repeat the same seminar for other JV's. Since then, I've closed $290,074 in sales in just 90 days of doing these seminars!" "We did two Cyber Security Seminars using these techniques that closed $211,000 just from those events AND generated $3,600 in monthly reoccurring revenue. All in all, I would say it's a success! Thank you for the formula for sales-generating seminars!" — Lisa Good, GSG Computers, Inc.